Not sure where to start? We can help! 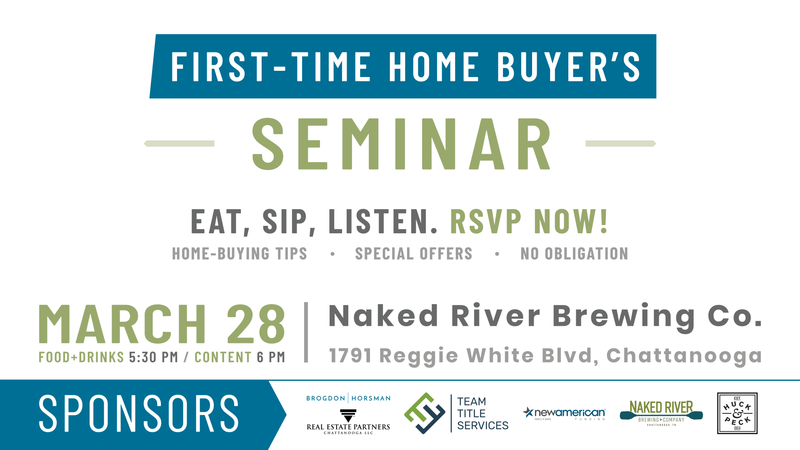 Our FREE First-Time Home Buyer’s Seminar will be held on March 28th with food and drinks being served at 5:30 p.m. and our content beginning at 6 p.m. Our event will be held at Naked River Brewing Co. on the Southside of Chattanooga. Attend and receive 2 FREE beer tickets and enter to win a $500 gift card to Huck & Peck. RSVP by texting 423.290.4416 or emailing laura@brogdonhorsman.com. You can also RSVP via our Facebook Event page. Our seminar is hosted by Brogdon Horsman, Real Estate Partners, Team Title Services, New American Funding, The Naked River Brewing Company, and Huck and Peck. Eat, sip, listen. RSVP now!